Ben and Sarah Meggs have reduced the vacancy rate in Sanford's Mid-Town Mall from 40 percent to 15 percent in about a year of ownership. SANFORD, Maine — Changes and improvements at the Mid-Town Mall are well underway and will continue, according to its new owners, Benjamin and Sarah Meggs. And efforts to revitalize the mall and its parking lot will get a major boost if the city of Sanford is awarded a $300,000 Community Development Block Grant from the state. Lee Burnett, the grant writer for the city, filed the application for the funds last Friday and said word about whether Sanford will receive them could come as soon as early May. According to Burnett, the funds, if awarded, will go toward three key parts of the overall project to improve the mall and its parking lot, which the city owns: the construction of a walkway that will pass through the lot from Main Street to the Gary D. Sullivan staircase; the restoration of a pedestrian-friendly connection from St. Ignatius Street to the lot; and the improvement of the mall’s façade. Burnett also said that the new connection from St. Ignatius Street to the mall will include a handicapped-accessible ramp. He added that the new passage will recall the connectivity of the days when Mechanic Street spanned from that area all the way to Washington Street. Burnett also said that the funds will help reconfigure the islands and the streetlights in the lot in order to allow for easier plowing in the wintertime and to create more parking spaces. The state has required a match of 25 percent of the grant total from the private sector. 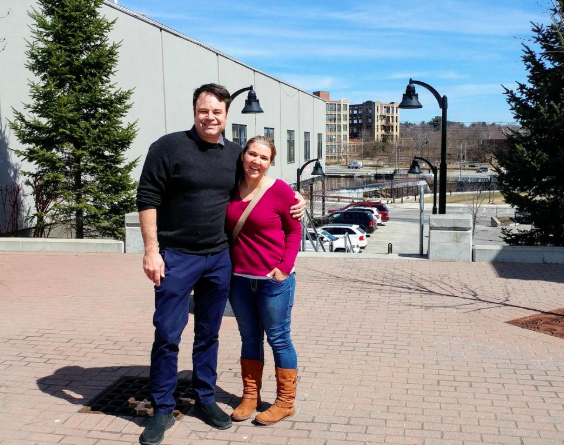 Ben and Sarah Meggs, who bought the three sections of the mall in early 2018, have agreed to provide that $75,000 match – and, actually, say they have budgeted as much as $40,000 more towards the beautification project. Ben Meggs and Burnett recently held a community outreach forum at the Sanford Town Club. Meggs presented his vision for a renewed Mid-Town Mall, and Burnett gave a presentation about the CDBG grant. Approximately 30 people attended that evening, according to Burnett. Many more – close to a thousand, according to Ben Meggs – have signed a petition in support of the project. Burnett said now is an ideal time to revitalize the mall. In the past, he said, there were obstacles — the mall had multiple owners at one time, for example, so developing a consensus on what needed to be done to improve the place was difficult. According to Meggs, the mall had a vacancy rate of 40 percent when he and Sarah purchased it over a year ago. Now that vacancy rate is down to 15 percent, with efforts persisting to occupy the current remaining spaces. There’s a new daycare, Kids’ Kove, on the lower level facing Riverside Avenue. Seacoast Career School has relocated from South Sanford to the lower level. CandyTubs, a new candy store, is owned and operated by the Meggs’ daughter, Claudia. Other stores include The Sandwich Shack, Jen’s Delightful Sweets, Mill Towne Tavern, a spa called Serenity by the Fal and B & J’s Vape Shop. All of these are new businesses that have opened at the Mid-Town Mall during the past year. Two churches and several nonprofit organizations also call the mall home. In the past year, Meggs has had the front of the mall repainted, giving its appearance a uniformity that it had previously lacked. The Riverside Avenue entrance on the lower level of the mall also has been improved. Previously, there had been two entrances, relatively haphazard and close together. Now there is a single entrance. That whole area also has been reconfigured, with crosswalks added, to improve safety for the children who attend the daycare there. The mall will be rebranded as the Sanford City Center. The old Mid-Town Mall signs — including the decades-old tottering one at the Washington Street entrance – will come down and new ones with the new name will go up. Within the next month, the Ben and Sarah Meggs plan to improve lighting at the mall – adding bistro-style lights at the top of the Sullivan staircase as well as pendants along the overhangs that line the buildings. Later on, flowers will be planted throughout the property. The mall, which opened in Sanford in 1969, had its heyday in the ’70s, ’80s and early ’90s, but eventually fell into disrepair. Burnett said that consultants going as far back as 2005 have always maintained that fixing the Mid-Town Mall would be key to the eventual revitalization of the entire downtown. During an interview earlier this week, Ben Meggs expressed a similar belief, saying that an improved mall could lead to more restaurants, entertainment, offerings for children, and more throughout the downtown. “Whether the grant is approved or not, we plan to start making improvements this summer,” Meggs said.